Hi everyone, here’s another one dungeon page from a collaboration with the webmaster of the site AideDD, the scenario version dedicated to 5th DnD is available on its website. 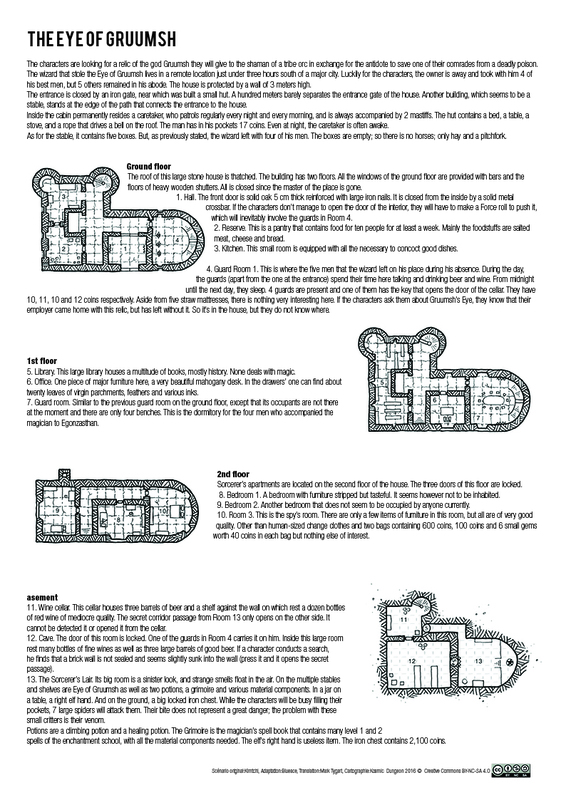 A big thanks to Mark Tygart for provided us a translation of this one page dungeon. The characters are in search of a relic of Gruumsh god they must submit to a shaman orc tribe in exchange for the antidote to save one of their own. The mark of the witch who stole the Gruumsh Eye is located in a remote to a little less than three hours walk south of a large city. Luckily for the characters, the owner is away and took with him four of his best men, but five others remained in its mark. The house is protected by a wall of 3 meters high. The entrance is closed by an iron gate, near which was built a small hut. A hundred meters separates the gate of the house. Another building, which appears to be a stable, stands by the road that connects the entrance to the house. Inside the house resides permanently a guard, relayed regularly every evening and every morning, and accompanied by two hounds. The cabin contains a bed, a table, a stove and a rope pressing a bell on the roof. The man in his pockets 17 Pa. Even at night, the guard is awake. As regards the stable, it contains five boxes. But, as stated earlier, the sorcerer left with four of his men. The boxes are empty; so there is no horse, but hay and a pitchfork. Looks good – do you have an English translation? The characters are looking for a relic of the god Gruumsh they will give to the shaman of a tribe orc in exchange for the antidote to save one of their comrades from a deadly poison. The wizard that stole the Eye of Gruumsh lives in a remote location just under three hours south of a major city. Luckily for the characters, the owner is away and took with him 4 of his best men, but 5 others remained in his abode. The house is protected by a wall of 3 meters high. The entrance is closed by an iron gate, near which was built a small hut. A hundred meters barely separates the entrance gate of the house. Another building, which seems to be a stable, stands at the edge of the path that connects the entrance to the house. Inside the cabin permanently resides a caretaker, who patrols regularly every night and every morning, and is always accompanied by 2 mastiffs. The hut contains a bed, a table, a stove, and a rope that drives a bell on the roof. The man has in his pockets 17 coins. Even at night, the caretaker is often awake. As for the stable, it contains five boxes. But, as previously stated, the wizard left with four of his men. The boxes are empty; so there is no horses; only hay and a pitchfork. The roof of this large stone house is thatched. The building has two floors. All the windows of the ground floor are provided with bars and the floors of heavy wooden shutters. All is closed since the master of the place is gone. The front door is solid oak 5 cm thick reinforced with large iron nails. It is closed from the inside by a solid metal crossbar. If the characters do not manage to open the door of the interior, they will have to make a Force roll to push it, which will inevitably involve the guards in Room 4. This is a pantry that contains food for ten people for at least a week. Mainly the foodstuffs are salted meat, cheese and bread. This small room is equipped with all the necessary to concoct good dishes. This is where the five men that the wizard left on his place during his absence. During the day, the guards (apart from the one at the entrance) spend their time here talking and drinking beer and wine. From midnight until the next day, they sleep. 4 guards are present and one of them has the key that opens the door of the cellar. They have 10, 11, 10 and 12 coins respectively. Aside from five straw mattresses, there is nothing very interesting here. If the characters ask them about Gruumsh’s Eye, they know that their employer came home with this relic, but has left without it. So it’s in the house, but they do not know where. This large library houses a multitude of books, mostly history. None deals with magic. One piece of major furniture here, a very beautiful mahogany desk. In the drawers’ one can find about twenty leaves of virgin parchments, feathers and various inks. Similar to the previous guard room on the ground floor, except that its occupants are not there at the moment and there are only four benches. This is the dormitory for the four men who accompanied the magician to Egonzasthan. Sorcerer’s apartments are located on the second floor of the house. The three doors of this floor are locked. A bedroom with furniture stripped but tasteful. It seems however not to be inhabited. Another bedroom that does not seem to be occupied by anyone currently. This is the spy’s room. There are only a few items of furniture in this room, but all are of very good quality. Other than human-sized change clothes and two bags containing 600 coins, 100 coins and 6 small gems worth 40 coins in each bag but nothing else of interest. This cellar houses three barrels of beer and a shelf against the wall on which rest a dozen bottles of red wine of mediocre quality. The secret corridor passage from Room 13 only opens on the other side. It cannot be detected it or opened it from the cellar. The door of this room is locked. One of the guards in Room 4 carries it on him. Inside this large room rest many bottles of fine wines as well as three large barrels of good beer. If a character conducts a search, he finds that a brick wall is not sealed and seems slightly sunk into the wall (press it and it opens the secret passage). Its big room is a sinister look, and strange smells float in the air. On the multiple stables and shelves are Eye of Gruumsh as well as two potions, a grimoire and various material components. In a jar on a table, a right elf hand. And on the ground, a big locked iron chest. While the characters will be busy filling their pockets, 7 large spiders will attack them. Their bite does not represent a great danger; the problem with these small critters is their venom. Potions are a climbing potion and a healing potion. The Grimoire is the magician’s spell book that contains many level 1 and 2 spells of the enchantment school, with all the material components needed. The elf’s right hand is useless item. The iron chest contains 2,100 coins. Oh man! You rock! Thank you so much for this translation. I’ll do the layout as soon as I can and I’ll post it here. Which name want-you to see appear for the credit? The sorcerer’s apartments are located on the second floor of the house. The three doors of this floor are locked. Its big room is a sinister look, and strange smells float in the air. On the multiple stables and shelves are Eye of Gruumsh as well as two potions, a grimoire and various material components. In a jar on a table, a right elf hand. And on the ground, a big locked iron chest. While the characters will be busy filling their pockets, 7 large spiders will attack them. Their bite does not represent a great danger; the problem with these small critters is their venom..Potions are a climbing potion and a healing potion. The Grimoire is the magician’s spell book that contains many level 1 and 2 spells of the enchantment school, with all the material components needed. The elf’s right hand is useless item. The iron chest contains 2,100 coins.